After reading their story, if starting a blog is something you are interested in we put together a step-by-step tutorial for you. Like Heath and Alyssa, we have discovered that starting your own business, like a blog, can lead to a TON of freedom in life. If you have the desire to live in an RV and travel full time starting a blog should be one of your top priorities. 1) Tell us about your story. Who are the two of you? What do you do? 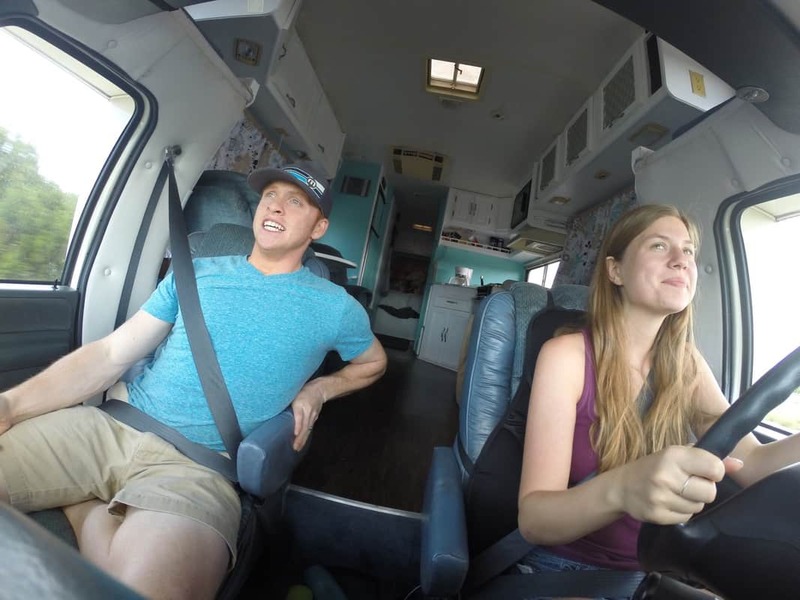 2) How did the conversation go when you guys had the idea to travel and live in an RV full time right after getting married? 3) Tell our readers about the documentary you made. 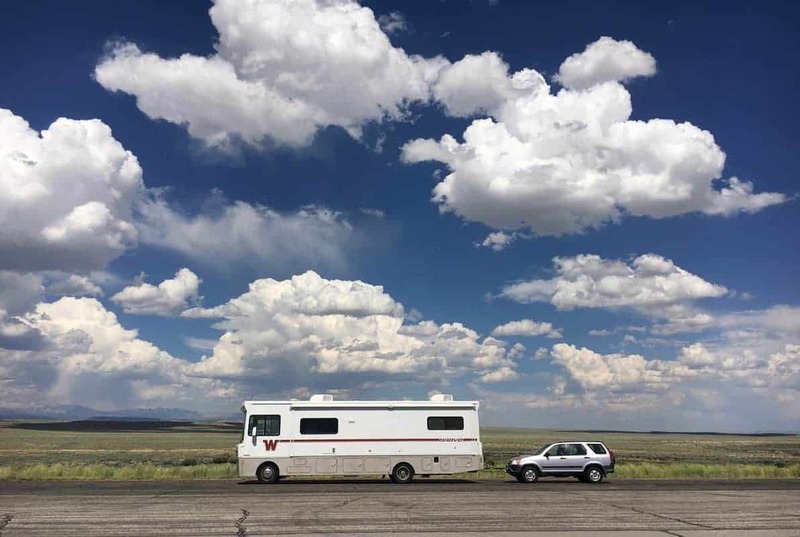 4) How did you save up enough money to live in an RV and travel full time? 5) Tell us about finding the right RV to start in and how it progressed to what you travel in today? 6) If someone were to come up and ask you how can I RV full time? What would be the advice you would give them to get started? 7) A lot of people love the idea of living in an RV and traveling full time across the country. How realistic is it financially? What is your monthly budget like? 8) How long do you plan on traveling for in your RV? Do you have any long-term plan of starting a family? 9) Tell us about your future goals and dreams as digital nomads. Where can our readers follow you on social media? 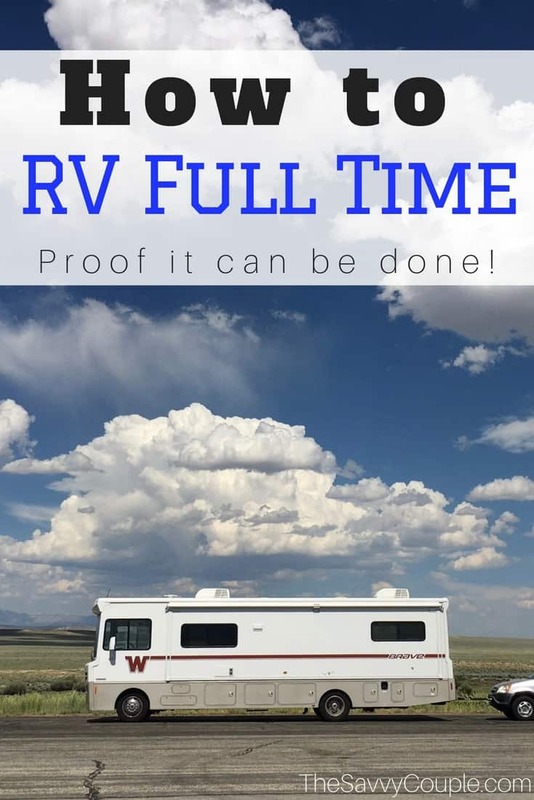 Have you ever wanted to live in an RV full time? 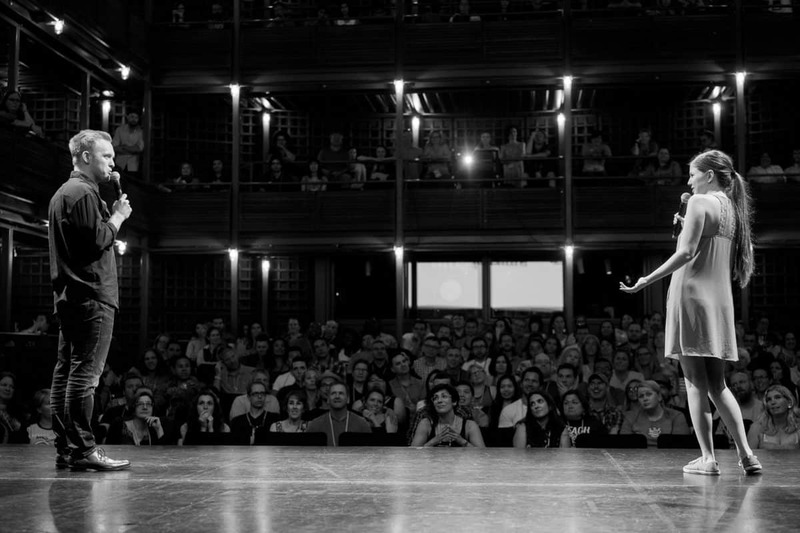 What is the one thing that holds you back from following your dreams? We are Heath and Alyssa Padgett and we’ve been full-time RVing for the past three years, the exact amount of time we’ve been married. Together we run a popular blog about traveling in an RV over at HeathandAlyssa.com. Heath hosts The RV Entrepreneur podcast, the #1 RVing podcast, where he interviews full-time RVers who run their own business on the road. I manage most of our blog, run our film production company, and just launched our Youtube channel where we are sharing vlogs about our travels. During our first year on the road, I filmed a documentary about our honeymoon adventure to all fifty states (which you’ll read more about below). Heath just launched CampgroundBooking.com, a software startup for campgrounds who want to accept online reservations. Right now, a shocking number of campgrounds manage reservations on pen and paper and only accept check or cash as payment. It. Is. So. Frustrating. We are trying to bring them into the digital age. We definitely had this conversation in stages and not all at once. At first, our goal was just to escape Texas summers because they are so unbearable. We chose five states we thought we may want to move to: California, Oregon, Colorado, Tennessee, & North Carolina. At first, we thought we would live in each of these places for a month at a time. Then I realized that required driving from the coast of Oregon to the coast of North Carolina. And it really seemed like a waste to drive all that way just to visit five measly states. Heath agreed instantly because he’s crazy. Buying an RV ended up being the most comfortable and financially viable option for us and I was shocked to find just how cheap some RVs are. We bought ours for $11,500 (and sold it 20K miles later for $10,000). After deciding to travel to all fifty states for our honeymoon, we knew we needed a mission or purpose to go along with our travels. We wanted to do something with our time that would be beneficial and force us to grow together…and we had ZERO ideas. So Heath met with a mentor and he suggested that since we didn’t know what we wanted to do, why not try everything? Why not work a different job in every state? Once Heath refined the idea, found us a sponsor, and convinced me to film the adventure for our first ever documentary (but mostly because of the sponsored honeymoon part), I decided his idea wasn’t half bad. I would like to note, however, I had absolutely ZERO experience in film at the time. I YouTubed and googled the whole process to act like I knew what I was doing. The documentary focuses not just on the actual work, but mostly on the people we met along the way and how they approach their jobs. There’s a lot of stigma with hourly workers, but so many of these people quit high-paying jobs so they could do work that was meaningful for them. Historically, documentaries are a terrible way to make money, so we opted to make our film available for free on Facebook, and just a couple weeks ago added it to Youtube. We didn’t! We didn’t save at all, at least not purposefully. I had savings from working all through college and that all went toward buying the RV. But we did not have any savings built up to keep us traveling full-time. That probably sounds stupid, but we were 23 and paying for our wedding at the time. Plus in order to travel full-time, we both had to quit our jobs. So saving money for travel wasn’t possible. Fortunately, Heath works best when his back up against the wall. Knowing we didn’t have money to fund the adventure ourselves, he found us a sponsor and we started our first service-based business on the road. He’s like an entrepreneurial superman. 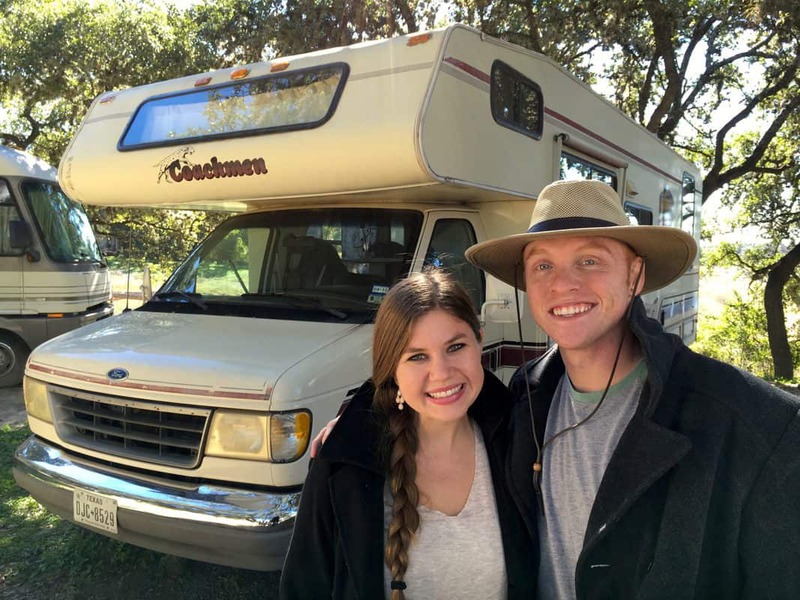 We bought what we could afford–a 1994 class C Coachman Leprechaun named Franklin. He was old, but he had character. We renovated him to look more like home (this was our first home together, after all). This is probably the most important thing you can do after you buy a used RV. Since we traveled to all fifty states in a year and life was always crazy, having a place to call home that actually looked and felt like home really kept us sane. We knew we needed a new home, one that was more reliable since we wanted to keep RVing indefinitely. After our documentary was picked up on CNN, CBS, and a handful of international news outlets, we had a few bargaining chips to start talking to RV companies in search of partnership. We chose to work with Winnebago, because they have the best reputation among American RV companies. Also, we had a standing opportunity to be on Going RV, which is the RV version of House Hunters. 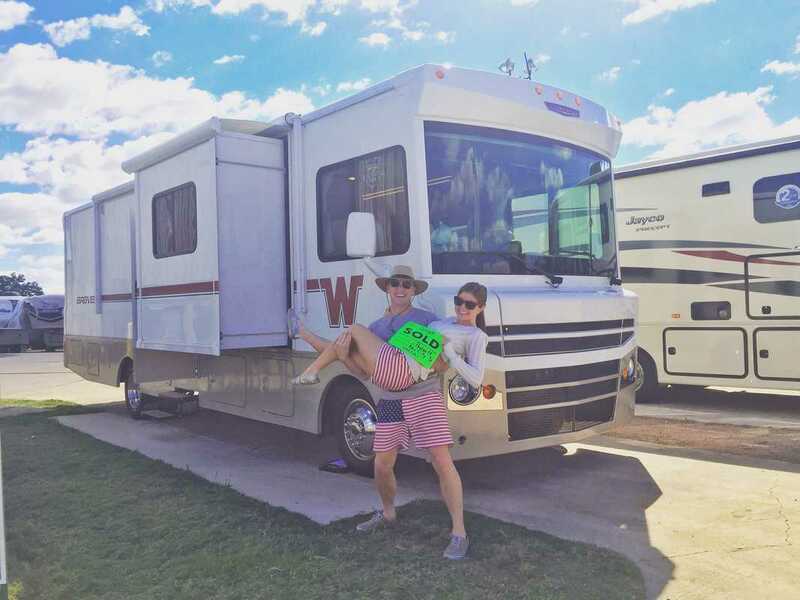 We leveraged this national tv opportunity plus our growing online presence to partner with Winnebago on buying an RV and blogging for them on the road. To be clear, we did not get a free RV and RV companies do not give away free RVs. People ask us how they can get a free RV all the time. It doesn’t happen! I don’t know why so many people think this. I don’t think anyone has ever actually asked us that, but we do have a bunch of free resources available to teach that. The course is all about the financial side of things and the guide focuses on all the logistics of actually transitioning into RV life. Really, the hardest part to getting started is recognizing that it is possible. It’s so easy to get caught up in finances, the stress of picking an RV, figuring out a work situation, explaining the lifestyle change to your family, etc. But if you can put it on paper, assign a launch date, and say I’m going to make it happen, you will. When we started RVing, there was no one our age RVing full-time (and if there was, they weren’t blogging about it for us to be able to find them!) We were 23 when we started and looking back, there were no two people less equipped for this lifestyle than us. But we knew we wanted to make it happen, and we did. So I manually update our finances every single week to keep a good pulse on this. We spend anywhere from $1,500-$2,500/month on living expenses, and usually another $1000/month on business expenses. Our business expenses are a lot higher now that we’ve hired on an editor for the podcast and started hosting more events. Financially, most RVers find the lifestyle is significantly more cost efficient than living in a sticks-n-bricks. Especially if you can buy a used RV and avoid a payment, and if you travel slowly, opting for week or month stays instead of nightly, you can save a TON of money. As far as making the lifestyle affordable, work exchanges or bartering with RV parks is extremely common! Many RVers just starting out who want to save money will go this route, working in park offices or cleaning bathrooms in exchange for free rent. We plan on RVing for the foreseeable future. I think this will be our last year to RV in America. Since we’ve already done all 50 states and a good portion of Canada, I’m really getting the itch to go abroad. Our goal is to spend next year RVing across Europe or New Zealand. We plan on eventually stopping our full-time travel lifestyle to start a family, but I don’t see us giving up the RV. I would be bored out of my mind if we lived in the same house year-round. Right now our biggest goal is to make our personal website profitable enough that we don’t have to take on any additional clients. Once that happens, I can devote more time to growing our Youtube channel and Heath will have more time and money to invest in Campground Booking. As far as following us online, a great way to start is by downloading our guide or joining our course. You’ll get a link with access to our private Facebook community of 6000+ other travelers when you join the course, which is a great place to ask questions and learn more about the lifestyle. That’s so awesome to hear! We would love to purchase an RV in the next couple of years and travel during the summer. This is awesome! Thank you for sharing Heath and Alyssa’s story. I really like learning about how people create lives of their own and break the norm handed to us by society today. It’s so nice to see stories like this. Far too many people get caught up in running the rat race a working their entire life at a job they dislike. I would love to travel extensively in an RV. But my husband and I aren’t on the same page on which type of RV. He wants the truck camper so he can go anywhere. I would prefer a little more room. We are new empty nesters, so hopefully we can come to some agreement in the next few years. Now is the time to adventure off without the kids. I’m sure you will come up with a resolution. Y’all should look at Class B’s like the Winnebago Travato or the Leisure Travel Van Unity! Can go anywhere and a little more room than a truck camper. We had a blast learning more about Heath and Alyssa. Such an inspiration. Thanks for stopping by. We plan on doing WAY more of these in the future so thanks for your feedback! Agreed!! I convinced Heath by sending him beautiful photos of places I found on Pinterest. Works every time. I’ve been trying to talk my hubby into RVing after retirement. I’ll have to forward this article to him. Nothing says subtle like sending him an article titled “How to Live in an RV” ??? Hopefully you can convince him! So interesting!!! I would love to do this. I love the RV Entreprenuers, that is the coolest niche ever! Awesome! Thank you so much for stopping by and commenting. We will certainly be checking out your social media. Such an inspiring post today! Wonderful. Your choice of adventurous lifestyle is admirable. Interesting and fun and a bit scary at the same time. I would assume they have a good plan on where to stay, my only issue would be people trying to break into your RV at night..but staying at campgrounds would probably make that a null point. What do you mean “break into camping at night”?